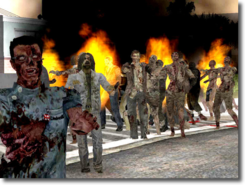 GTA: San Andreas Zombie Alarm Mod is a terrifying mod for GTA: San Andreas that sees hoards of zombies invading your game! There are some people out there who can't imagine better words to hear together than GTA and zombies. If the very idea seems like all your dreams come true, then GTA: San Andreas Zombie Alarm Mod is undoubtedly the mod for you!